‘Deftly combining detailed documentation with impressive first-hand accounts, David never forgets the human cost of this “unsavoury horse-trading”… [He] perfectly conveys the shock and the shame of these proud Highlanders, more than 10,000 of whom were sent to prison camps’. David does full justice to this “forgotten piece” of history. 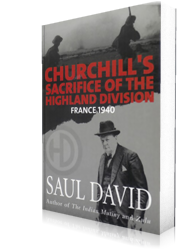 David proves conclusively that Churchill allowed the Highlanders to be cut off.